On December 30, Beijing announced that it would ban all domestic ivory trading and processing by the end of 2017, in a move hailed by conservationists as a "game-changer." On the face of it, the development seems unequivocally positive. Banning all domestic trade would considerably streamline enforcement operations since without a legal market, any processing or sale of ivory would become automatically illegal. However, the ban is only one part of the puzzle. And as with other complex, transnational problems, ranging from the drug trade to illegal fishing, every piece will have to fall into place before the world stops losing one elephant every 15 minutes to poachers. And sadly, in its current form, the ivory ban is not nearly far-reaching enough to achieve that objective. As it turns out, banning the legal sale of ivory would barely register, as more than 90% of the ivory sold in China is processed through the black market. Officially, the multi-billion dollar industry is administered by a just a handful of venues, half of which are slated to close in the coming months. What's more, the ban is only aimed at mainland China - Hong Kong has until 2021 to end its share of the very lucrative ivory trade. What this means is that after 2018, the trade could simply move south, with the autonomous territory becoming the main hub for wealthy Chinese on the prowl for the "white gold." Some even fear that with the ban in effect, poachers hunting elephants in Africa are in for an even bigger windfall as ivory prices will probably skyrocket on the black market. Currently, one kilogram of the stuff fetches more than $1,100 per kilogram - in government-sanctioned stores. Were Beijing serious about its plan to protect elephants, it should have gone a step further and stop residents from buying their ivory from markets in neighboring countries, such as Laos, Vietnam, and Myanmar. This would require, at a minimum, regional policing efforts, and ideally a full regional ban on ivory trading and processing. Beijing will also need to cooperate with African countries to crack down on the mainly Chinese-run criminal groups that have been poaching in Africa. The continued, legal sale of mammoth ivory is also likely to throw a wrench into enforcement efforts. Some observers worry that its legality provides another technique for laundering, since elephant ivory can be passed off as mammoth ivory. Not only that, but the government's announcement has a potential loophole that allows "cultural relics made of ivory that are of legal origin and have been verified by a specialist appraisal body" to be auctioned under supervision. This could mean that the trade of ivory antiques, or even ivory objects that have artistic value, would continue. Instead of permitting certain ivory objects to be sold, the government should ban the sale of all ivory, antique or not, to cut down on demand and to send a clear message that the material has no more cachet. So then what explains this much-hyped but otherwise half-hearted approach? While the goodwill to change a deeply ingrained cultural habit is there, it's much more likely that Beijing is merely attempting to score a quick PR win with its trade partners in Africa, where the elephant population has steadily declined at the hands of Chinese-run gangs. The ban on ivory allows China to burnish its image as a protector of the environment, especially at a time when the US is set to be run by a mainly climate-skeptic administration. But much to Beijing's dismay, this superficial window dressing will not buy it much favor in Africa. In fact, banning the ivory trade would just solve the tip of the iceberg when it comes to China's illicit activities on the continent. As with the ivory trade, other transnational illicit practices will have to overcome numerous hurdles before they will be finally eliminated. For instance, Chinese fishing vessels have been operating with impunity along Africa's coasts, draining the fish populations and harming the marine environments of poor countries such as Guinea and Mozambique. Despite the devastating consequences of illegal fishing, these governments have been left with their hands tied since they lack the resources or the will needed to properly police their waters. In 2013, for instance, Mozambique's government undertook a number of initiatives to try to crack down on illegal fishing along its 2,470 km coastline, since only one of the 130 boats in national waters belonged to Mozambique and the state was losing an estimated $65 million per year due to the practice. The government undertook a number of investments to shore up its maritime surveillance abilities and bought a fleet of patrol vessels to police its waters. However, the boats have lain fallow while illegal fishermen continue to operate freely, furth throttling the government's ability to repay its debts or boost growth. Although progress has been made in the fight against illegal fishing - such as the recent signing of an international treaty under the auspices of the UN - it's clear that numerous obstacles persist. While the Port State Measures Agreement (PSMA) aims to bring an end to unlawful fishing practices and has been signed by the EU, the US and 28 other states, China has so far declined to follow suit. 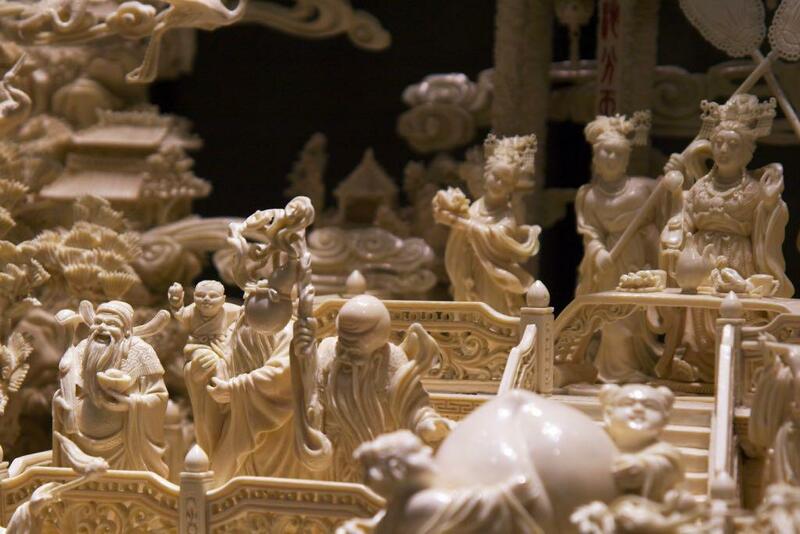 So while China's ban on the ivory trade represents a huge step forward for a country that only recently called ivory carving part of its intangible cultural heritage, it's simply not enough to turn Beijing into the responsible international actor it claims to be. A cultural shift will have to take place, in which consumers no longer see the consumption of illicitly obtained goods as acceptable before Beijing is able to fill the shoes left by a retreating and self-centered U.S. As with efforts to end the demand for drugs or unsustainable seafood, this shift will be the last but perhaps the trickiest part of the puzzle.